At my school we have decided to get into a 1:1 device programme. Starting from scratch. Daunting as this initially sounded to me, it has been an amazing journey and one that is truly valuable in my career. It all started 12 months ago when we tabled the idea of developing a truly innovative technology programme (at the time this sounded impossible considering where we were at). We set off to come up with a plan and did our research into why/how will this help the learners in our school. We narrowed our initial ideas down to running a BYOD programme or a school owned and leased 1:1 device programme. After much debate and research into other schools programmes we decided that a 1:1 device programme was more suitable to our setting. The next big thing was what device…. Now, our school is a PC school (hard for me to come to grips with being such a passionate mac fan) so we enlisted the support of Microsoft Singapore. From day one we knew this partnership was going to work. Microsoft supported us with every spanner we threw in the works and provided on-site service whenever we had questions. The process began when they brought in a team of staff and a bucket load of device options – from laptops to notebooks to tablets. None of which tickled our fancy – it just didn’t seem right – I just didn’t feel comfortable promoting a truly innovative technology programme if we were to choose an outdated device. The announcement of Microsoft’s Surface device – this sent chills down my spine – we had to try this and within 2 weeks we had a sample shipped in via Microsoft from USA – wow what a device …… It had everything we wanted and ran office products that would support our school network and our IT technicians could see all sorts of possibilities….. However, after many weeks of excitement we found out that the Surface Pro was not going to be available in Singapore in time for us to launch our 1:1 programme in February 2013. The search was on again for that one device we knew was cutting edge….. Then in October 2012 – we found it!!! 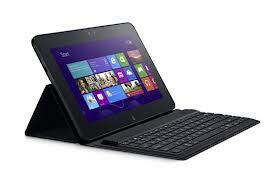 Dell had just announced the upcoming launch of the Dell Latitude 10 tablet device. Slim design, light, windows 8, durable, USB connection, touch screen, interactive technologies – it had it all. December rolled around and all of our documentation was starting to come together – we had gained the support of our school council and our very supportive community of parents. Working in partnership with Microsoft we got a sample in and immediately placed it where it mattered – in a classroom. We wanted to see first-hand if it was easy to pick up and use and if it was everything we hoped it to be. Needless to say, it was a hit and on February 1st 2013 we launched our 1:1 device programme for year 5-7 students. All of the meetings, policy documents, discussions and research was worth it. We are finally here. The kids are pumped, the teachers are excited and the parents can’t wait to utilise this ground breaking technology. We have now launched – were we ready? Only time will tell. All I know is that our students are incredibly lucky to be where they are and to have the opportunity to lead the way in a Microsoft driven environment – 3 words sum it up for me … BRING IT ON! Watch this space for updates on our 1:1 device programme and follow me on twitter @mrkempnz for daily updates on our progress, the good and the bad and the inspirational. Please share this with anyone you think needs a bit of inspiration. Will be keeping track of this really closely. We have just gone 1:1 with blogs (130 in four classrooms). We are going to go 1:1 devices next year as well, are very close to that now and have some things in common. Was lucky enough to visit your classroom last week form New Zealand and look forward to seeing this develop. I am enjoying reading about your journey! We are starting 1:1 in the fall of 2014 and I am a part of the team planning deployment for the school.